Our Mission: Keep the music playing! Yes, I do mods! Epiphone Junior Mods, Fender Hot Rod DeVille Mods, Twin and Twin Reverb Mods, Marshall JCM-800 Mods, and so on. What kind of mods? See the MODS on my Services Page for a list and prices. A NEW edition of my book has just been released! The perfect gift for that tech-head musician or technician that loves to work on guitar amps. Click for preview of inside. This new edition has been updated with the latest problems and now includes the parts used in the repair! 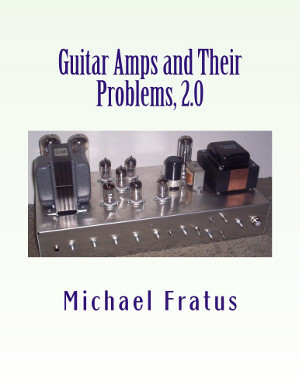 New edition of my book, "Guitar Amps and Their Problems, 2.0" - Updated and Improved! With over 2500 entries of service records for many popular (and rare) makes and models of (mostly) tube guitar amps and other gear! The HushPuppy is a plug-in module that replaces your output tubes and reduces the power substantially, allowing you to overdrive the output stage at a much lower room volume. No modifications are needed to your amplifier, other than removing one or more output tubes and replacing with the HushPuppy. It does not matter if your amp is Single-ended (Fender Champ, for example), Class-A (Vox AC-30 and many others), or Fixed-bias [which includes adjustable bias]. The HushPuppy creates its own environment within itself. But don't mix Class-A original tubes and the HushPuppy. The Vox AC-30 has its tube cathodes in parallel, and if you pull one tube, the rest draw more current to make up for it. Always check before purchasing if you are unsure of how your amp is biased. Eventually I will provide a table for this. As an output tube, the HushPuppy can use quite a few standard preamp tubes that you probably already have: 12AX7, ECC83, ECC803, 7025, 5751, 12AT7, 12AU7, 12AV7 ...and more variations of pin-compatible tubes. There is a long list. So, how does it sound? Expect a change in tone, but not a bad change. It is more capable of high and mid-range sound than huge chunky lows, since the surface area for carrying current is so much lower, but that is not always a bad thing. The first one I installed on a Hot Rod DeVille had the owner saying, "Finally, I can play my guitar at home!" I have built several amps with the HushPuppy technology built in, and they all sounded good. The demo for this Box was done by Michael Anthony Shanks. A really great-sounding and informative YouTube video. Excuse the appearance... This is the most-recent pre-production model. It has a 3-position distortion level control, a tone control, and an output level control. The latest model has 4 levels and a Fuzz switch for those who want lots of fuzz. Plus, always True Bypass and operation on standard 9V battery or standard stomp box power supply. The new 4-Level Fuzz Version is in production! Available for $185. I have finally started a separate amp-building effort under the name "MudBone Amps." All the other names were taken. They are intended to be simple amps that are reliable and usable, and of course, affordable - without looking like cheap junk. The amps will be made here in Houston, and will be customizable for tone. Check out the new site at MudboneAmps.com and follow the progress. A relatively unknown cause for an amp to stop putting out sound or to put out really nasty sound is shown in this YouTube Video. If your amp has an effects loop, please watch the video. You can save yourself some trouble. OK, so you know your controls are scratchy... how hard can that be to fix? Well, it depends. First, don't pull off the knob and spray some lubricant onto the pot shaft - that won't do a thing that is good, and may put whatever you are using inside the control. Especially don't use a "no residue" spray, as that just washes off the lubricant that belongs there. Sometimes the control is so bad that it needs replaced. See this video of me replacing a volume control in a Fender Hot Rod Deluxe. Its 4x time-lapse, so a 20-minute job takes 5 minutes. And, sometimes its not the control at all, its a cap allowing voltage to get to the control. In that case, you need a technician. We repair, design and build Vacuum Tube Amplifiers and effects, pedals, vacuum tube microphone amps, instruments and so on. While not a tube snob, I do find that tubes provide a much more musical and natural sound than most solid-state gear. If I do make solid-state amps, I will strive to design them to be natural-sounding and not sterile. Although Guitar Amp Repair is our main business, you are welcome to ask about other vacuum tube devices. Take a look at the Amps and other products that I build. A new product is an EF86 tube converter, which lets you use quieter tubes in the EF86 position, because most all EF86 tubes I find are terribly microphonic. For repair services, look at Repair Services for more information. Want to build your own amp? See Amp Kits page. Did you find something you liked here? Use my Tip Jar! For your enjoyment and for a chance to see something new, see these Videos. Many are local bands, but there are also some tutorials and demos. If you are interested in lots of opportunities to learn electronics for audio there is a page for that, as well. 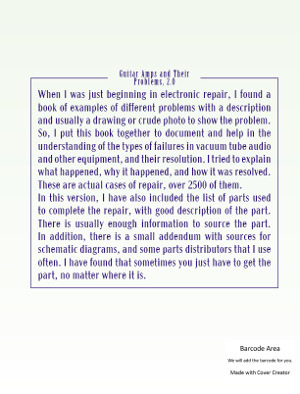 And, finally, there are Links to lots of stuff, from electronics references to stores and parts suppliers. Also, sources of schematics for your equipment. If you have a Vox or another amp that uses the EF86 tube for vintage sound, you probably know that this tube is notoriously microphonic. Its hard to find a current production or even an Old Stock tube that is not microphonic. I have a solution for that. My new EF86 Tube Converter will plug into the EF86 socket and allow a quieter 6AU6 tube to be used. The first units are now available. Call for pricing. Secondary Mission: Provide information for musicians. Its hard to depend on somebody to take care of your equipment as carefully as you would. That is, if you knew how. You know how important it is for stuff to work. I think that everyone should know at least a little about the equipment they use all the time. Even if you only learn some basics, it will help in the long run when deciding what to do about problems or when selecting new equipment. I prefer to have some idea about what is inside some "mystery box" that I use all the time, or at least have a vague idea of how it works. Eventually I will probably open it to see what makes it tick. There are lots of places on this site to learn anything from the basics to advanced electronics, or even how to solder properly. Serving Houston and the surrounding areas, such as Alvin, Angleton, Baytown, Bellaire, Clute, Conroe, Deer Park, Dickinson, Freeport, Friendswood, Galena Park, Galveston, Humble, Jacinto City, Katy, Lake Jackson, La Marque, La Porte, League City, Missouri City, Pasadena, Pearland, Richmond, Rosenberg, South Houston, Stafford, Sugar Land, Texas City, The Woodlands, West University Place and all the Greater Houston Area. If you are up to the drive, serving Austin, San Antonio, New Braunfels, Corpus Christi, Bryan, Round Rock, Georgetown, Huntsville, Beaumont, Lake Charles, Port Arthur, Victoria. Receiving UPS, USPS, and FedEx shipments of equipment from all around. If you ship "return shipping paid" you will get a better shipping rate. Acoustic, Alembic, Alesis, Allen, Ampeg, Ashdown, B-52, Bad Cat, Andrews, Ashton, B.C. Rich, Blackheart, Blackstar, Bogner, Bruno, Behringer, Carvin, Crate, Crown, Diezel, Earth Amps, EBS, Eden, Burgera, Carr, Diaz, Divide by 13, Cornford, Elmwood, Framus, Garnet, Electro-Voice, Epiphone, ENGL, Fender, Fuchs, Gallien-Krueger, Genz-Benz, Gibson, Hartke, Hiwatt, Hoffmann, Ibanez, Johnson, Heritage, Hughes & Kettner, Koch, Matamp, Mojave, Naylor, Kendrick, Korg, Krank, Kustom, Laney, Legend, Line 6, Marshall, Matchless, Mesa-Boogie, Metaltronix, Orange, Peavey, Randall, Reeves, Rick-Tone, Ross, Selmer, Session, Sewell, Soultone, Rivera, Rocktron, Roland, Silvertone, Soldano, Sound Research, Sovtek, Squier, Sunn, SWR, Tech 21, Top Hat, Trace Elliot, Trident, Stephenson, Straub, Suhr, Supro, Synaptic Amps, THD, Tone King, Trainwreck, Traynor, VHT, Vox, Yamaha, Yorkville Sound, Two-Rock, Valco, VSP Labs, Yerasov and more.